It has been twenty two years since I saw the first Jurassic movie with my father and brother in a movie theater. We saw it back then just before or after Father’s Day in June of 1993. When it was announced when Jurassic World would be released my brother asked our Dad if he wanted to see it and he said yes. My father likes doing things for Father’s Day over receiving gifts with his cards. Though he is partial too them they just aren’t as exciting as an activity. 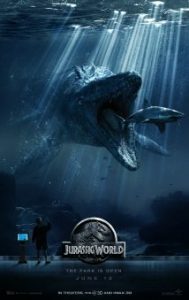 We decided to see the film staring Chris Pratt and Bryce Dallas Howard on the first day it was show in non 3-D, Friday June 12th. The film itself fit in well with its predecessors and except for the third film which I think missed its mark. Jurassic World was fast paced and the dinosaurs looked awesome. I can’t say I was nearly as pulled in as I had been with the first film, the magic of the Jurassic kingdom just hasn’t held up over the years for me. Maybe it comes from the fact that a running complaint in my family especially by my mother is how ad nauseam the films are aired on either TNT, AMC, and FX and how my Dad just has to tune in to see whichever film it is. It drives her nuts and it drives my brother and I crazy when we come over for a visit and he is watching one of them. Still it is neat no matter the years that have gone by that my Dad still finds each film watchable. I think Jurassic World will do really well and that a fifth film will be made. It certainly had some new life breathed into the franchise just with Chris Pratt presence alone and the kids Gray and Zach played by Ty Simpkins and Nick Robinson were good too. If it could be found a way to bring the kids back or at least make Bryce Dallas Howard’s Clare more interesting, another film would certainly work well. I also hope it doesn’t take nearly as long as it took since the third film 13 years earlier that had the final appearance of Sam Neill and William H. Macy. And I might even suggest to my brother we take Dad to see this new film in the theater as well.